And yesterday while we were in Landmark Mall we saw in Marks and Spencer a beautiful Cinderella gown and it’s reversable so I asked her if she wants the gown and excitedly she said yes, she wants it. So, there now it’s settled. Her fourth birthday party would be a disney princess themed party. It’s just a simple party with all her friends in costumes and at least we settled the theme and the rest would be taken cared of by momsy. Princess enjoys watching the animated musical adventures of five preschool friends, Uniqua, Pablo, Tyrone, Tasha, and Austin. 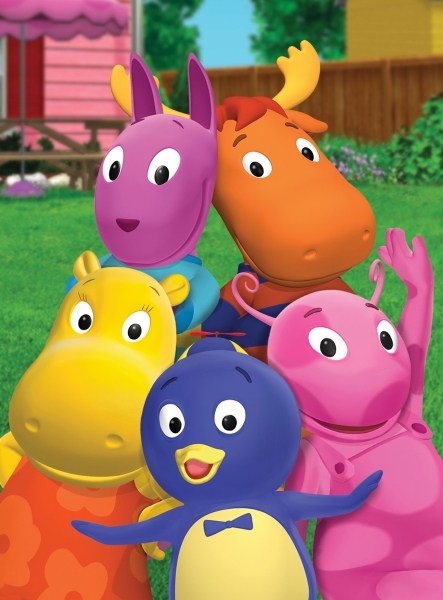 They are the Backyardigans. She loves Tasha singing in her Princess Cleotasha role in the episode of “The Key to the Nile”. This episode teaches the importance of sayoing “please and thank you”. And adores Tyrone and the gang with their Pirate Treasure escapades. Every now and then you’ll hear her say “Arrrr, Arrr, Arrr!”. Now she’s watching the Polka Palace Party episode. She’s asking me if she can have a clarinet, a tuba, drums and an accordion. She saw Tyrone using a tuba, Pablo with an accordion, Austin enjoying in a raft with his drums and Uniqua singing with her clarinet. They were cowboys and a cowgirl, and Princess too wants to be a cowgirl! Princess got a gift from Ninong Robin, a VCD of Dora The Explorer, it’s her new fave movie. Everyday, she wants to watch Dora and Boots and sings along with them. Not only the movie she’s watching and also she got hooked on the the activities, stories, games, everything on Dora the explorer website. Barney and teletubbies got some rest but still they are her best friends.